500 Days Of Film Reviews Comedy, Mascots, Starring Parker Posey, Tom Bennett, Jane Lynch and Chris O'Dowd. In this comic faux-documentary from director, Christopher Guest, eager contestants don gigantic heads and wear the fluffiest of suits to compete for the title of the World's Best Mascot. If I'm honest, I've never really given much thought to mascots or, indeed, mascotery. 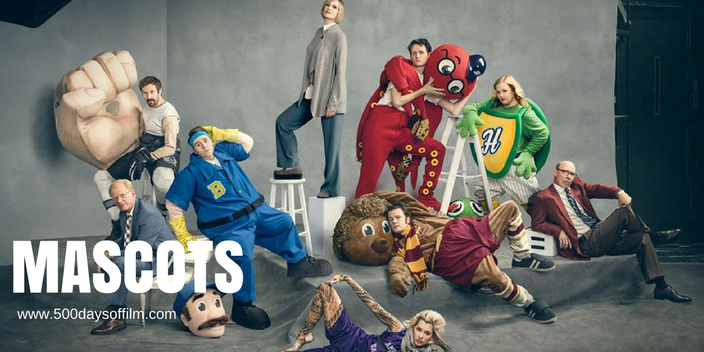 However, Christopher Guest's new film, Mascots, has given me a whole new insight into this noble profession. mascots. They are part of a team, but also not part of the team. They perform to crowds but, thanks to a mask or large foam head, remain largely unknown. What makes a person become a mascot? This is exactly what Guest's movie sets out to explore. Via fictional 'to camera' interviews, the life behind the costume is revealed as a group of mascots prepare to compete at the World Mascot Awards. However, this is no mock-doc. Mascots is hilarious but there is no room for cruelty here. Guest displays deep affection for his characters and we love them even as we laugh at their antics. Mascots features some truly wonderful comic performances. Jane Lynch is brilliant as judge, Gabby Monkhouse, Parker Posey is superb as armadillo mascot, Cindi Babineaux, and Chris O'Dowd is hilarious as Tommy 'Zook' Zucarello. Special mention must also go to Christopher Moynihan's Phil Mayhew - his final performance is comedy gold. However, just as he did in Love & Friendship, Tom Bennett steals the show as Owen Golly, Jnr. He is absolutely hilarious as Sid the hedgehog and also completely lovable. I laughed all the way through Mascots. This film is wonderfully enjoyable fun. If you have, what did you think of this faux documentary? Do let me know - leave me a comment in the box below!